Southern cape forest subtype 3: Medium moist high forest. Entrance Fee (Terms): It's free to visit The Big Tree. 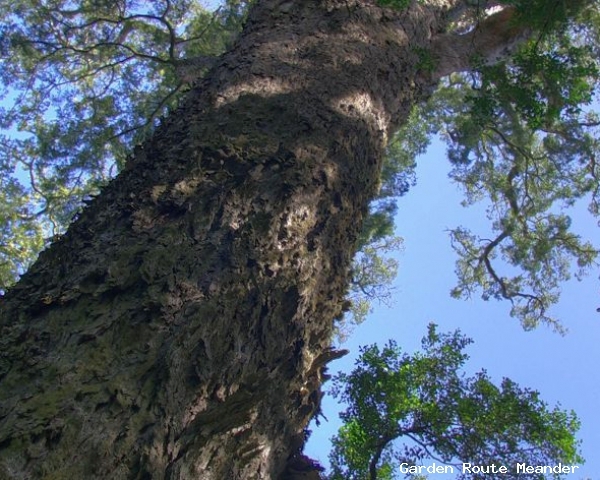 Description of Attraction: The Big Tree in the Tsitsikamma stretches its distinctive yellowwood leaves skywards, towering over the other trees in the canopy. This tree is estimated to be between 600 and 800 years old, and is well worth a special visit. The origins of the town name Knysna are probably from the Hottentot words 'Xthuys Xna', which mean 'place where the wood is'. An entire industry sprang up around the beautiful yellowwood trees in the forests of the Tsitsikamma until South Africa's national tree became an endangered species. Some of the trees that were felled for their pale, unblemished wood were over a thousand years old, and now, the largest remaining yellowwood is doesn't even approach this venerable age. Fortunately some of these ancients have survived. In the Tsitsikamma Forest, near Plettenberg Bay, you can catch a glimpse of the majesty that once ruled the forests on a short walk to the big tree. Although visitors to Plettenberg Bay are drawn to the scorching white beaches crammed full of sun worshippers in the summer months, they can find respite from the heat and crowds on the forest path to the Tsitsikamma Big Tree. This tree is estimated to be between 600 and 800 years old, stands 36,6 m tall and has a trunk circumference of 9m. From a parking lot on the side of the N2, a boardwalk path leads visitors through the dappled light of the lush, cool forest. The forest boardwalk is well maintained and visitors can walk the 1km round trip to the Tsitsikamma in a comfortable 10 minutes. Two additional trails start from the same spot for the slightly more intrepid hiker: one of 2,6km and another of 4,2km. For anyone who loves trees, there are any number of other activities in the area to appeal to the nature lover in you, from zipline canopy tours to tubing down a black water gorge, or even taking on the world's highest bungee jump off the Bloukrans River Bridge for the truly adventurous.